The problem with being the Guinness Book of World Records holder as the Oldest Person Alive is that by the time you receive the title, nobody else is alive that you were competing against. Everyone on Earth born before you is dead! That’s kind of a bummer. Interviewer: Congratulations Mrs. Ancient, how’d you manage to become the oldest person alive? That’s it, isn’t it? You have to wait around and hope all the older people die before you do. Oh, and once you get the title, there’s a bunch more waiting around hoping you’ll die so they get the title. It’s the ultimate relay baton-passing game. Of course the famous story of Jeanne Calment is a good one to end on. In 1965 at the age of 90, Jeanne Calment signed a deal to sell her former apartment to lawyer André-François Raffray, on a contingency contract. Raffray, then aged 47, agreed to pay her a monthly sum of 2,500 francs until she died, an agreement sometimes called a "reverse mortgage". Raffray ended up paying Calment more than the equivalent of $180,000, which was more than double the apartment's value. After Raffray's death from cancer at the age of 77, in 1995, his widow continued the payments until Calment's death in 1997 at the age of 121. Talk about a seemingly good deal going bad! My vote's in for the extreme BBQ thingy and interesting couch...er? Ooh one more thing: was that "perserverance" or "preservatives"?-LOL! Oh, I think managing to stay alive and attain that title is definitely a feat of endurance – one I have no desire to emulate or achieve! Gertrude Baines, the oldest woman in the world, just died. Now see that is what I call getting ahead. Live until your 121 years old and collect money doing so. I happened to mention, last weekend, that I didn't want to leave 'til I was really ancient and piddling in my pants, and that I'd happily pop my clogs at about 70. That really upset my Dad, who's 74. oops. Live. Live 'til I was really ancient. Damn this early onset Alzheimers. She was 121? Wow! That would mean I'd have 81 more years to live! I can't even imagine what the world would be like in 81 years. Old is relative. I used to think 40 was old. Now 70 doesn't seem old, but 80+ does! The other problem with being in the Guinness book of records is that by the time it's published you've shed your mortal coil anyway! that apartment deal was a pretty good one, i remember reading about it. I guess ya win some and ya lose some. lol. Imagine how Tom Hanks felt in the Green Mile. Dang! I want a reverse mortgage! Now! Wow! She looks exactly like I feel during a migraine! When I heard about this I was waiting for someone to say the thing that always make me laugh in cases like this, "No cause of death has yet been released." Helloooooooo how about old fricking age being the cause!? Cheers VE!! I'd probably hold some kind of world record if I didn't have to do anything to get it. You've inspired me to contact Guiness about a new category of records. There's to be more recognition for doing nothing. That way, I'd maybe have a chance of getting in. Now if only I wasn't too lazy, I'd come up with these categories and write a letter. that means i'm not middle-aged yet! kurt - I saw that...coincidence? english mum - See...you're already blabbering about living and leaving. Don't forget about laughing, loving, and laundry...the other important l words. elizabeth - Me neither. Can you imagine how bad the TV shows will be then? reforminggeek - You're right, old is relative. I've got a few of them in my family too...seems like all the relatives are old! baino - Yeah, that's a shame. The one category you don't get to see your name in print! lime - I'm sure that's what motivated her to live that long. janna - If you go back in time long enough; nobody will be there to care! matt-man - Yeah...they never do admit to that cause do they. They have to get all scientific on us! candie - Wow, that means you'll be alive to see them invent an instant toaster! roy - Perhaps you already do and you don't know it because it would mean going to look it up! anne - See...there's always a bright side! hmmm, good point - I will see if I can get someone else to check into that for me. dee - You don't have to worry about being vain...you'll be the hottest 121 year old on the planet. Of course, you'll probably be the only one too! Less competition! roy - Delegation! Good move... you obviously have management potential. I remember that story about the French apartment very well. I loved it because it was one of the few occasions where an old person got the better of somebody younger. Go old persons! "janna - If you go back in time long enough; nobody will be there to care!" On the other hand, it would be a nice quiet world where my headache would go away. Unless the dinosaurs ate me first. chris wood - Yeah...air brushing is becoming a real art form! Mike WJ - I smiled when I first heard the story too! Wonder what she'd look like had she had years of plastic surgery. perpetual chocoholic - I think at 121...neither approach will help anything! Crikey! What a sucky deal! ugh - i don't ever want to get old. old people scare me...and before you ask, yes, they scare me worse than clowns! No way I want to live that long and see everyone I knew die before me... no frickin' way. maureen - Better to burn out than fade away! For some totally unknown reason, I've always wanted to live until the tricentennial. Don't ask me why, I'm not even particularly patriotic - but at least I only have to make it to 107. Those government run death camps are looking better all the time? I'm gonna start burning the candle form both ends! megan - Will you ride a tricycle in the tricentenial? Just so you know last place is just as much fun as first place. LOL. 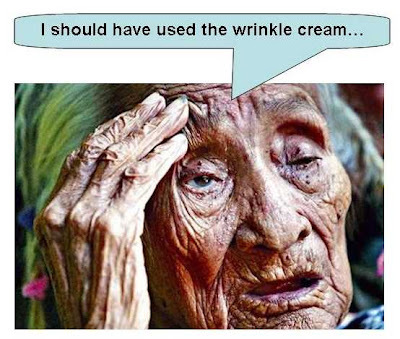 God bless and get that lady some wrinkle cream.